Butter – it’s brilliant! 21 October 2015. 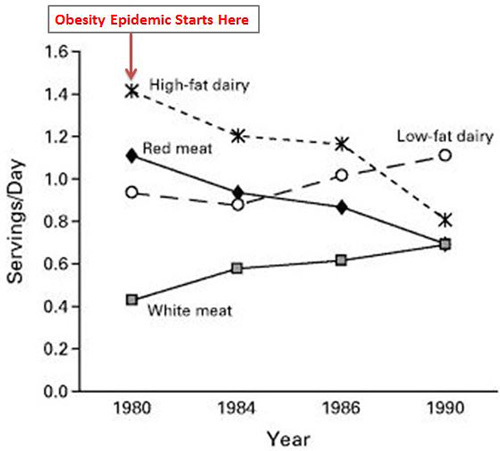 Tim Noakes of Realmealrevolution.com argues that as the population increased their carbohydrate intake to compensate for the newly reduced fat intake, rates of obesity soared. They have continued to rise ever since. 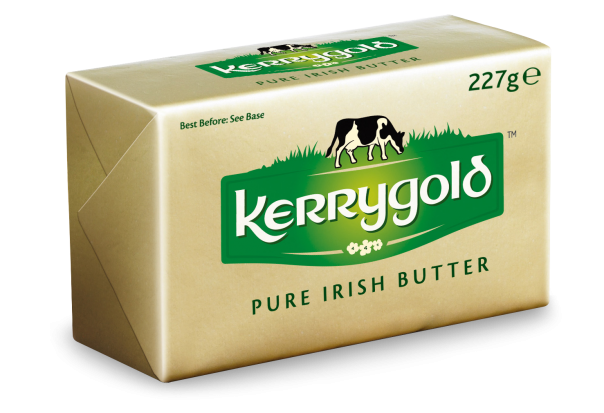 An article in the UK Independent also explained that butter was in fact one of the new “good fats” – and Irish butter in particular is prized by many because it comes from exclusively grass fed cows – nobility in butter society! One of the biggest findings in recent years is that the supposed link between heart disease and saturated fat does not exist. An excess of anything is bad for you, but remember banting is never about excesses – it is about eating good nutritious healthy unprocessed foods, and feeling healthy as a result. Butter contains glycospingolipids – basically stuff that’s good for your gastrointestinal tract – it keeps it healthy! Butter is great for your brain – which apparently is made up of a lot of fat – it kind of looks like that doesn’t it – and butter contains oleic acid – lots of it – to help maintain the myelin coating on those neurons. Grassfed butter such as ours is full of something else – called CLAs or conjugated linoleic acids, as well as aforementioned oleic acid, and myristic acid – all of which have proven cancer fighting properties. Butter is a great source of Vitamins A, E and K2 – which is important in the prevention of osteoporosis. What’s not to love there? 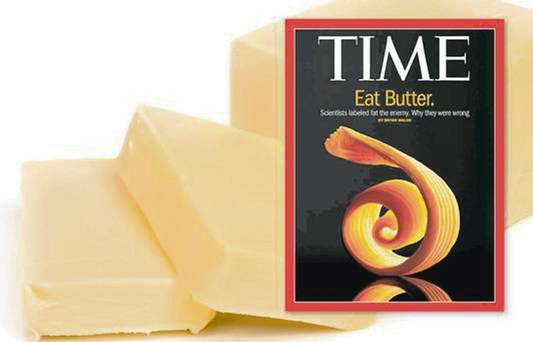 Even Time magazine jumped on the story as far back as June 2014 – butter was on the front page! Not as glamorous as the cover of Vogue but you never know! 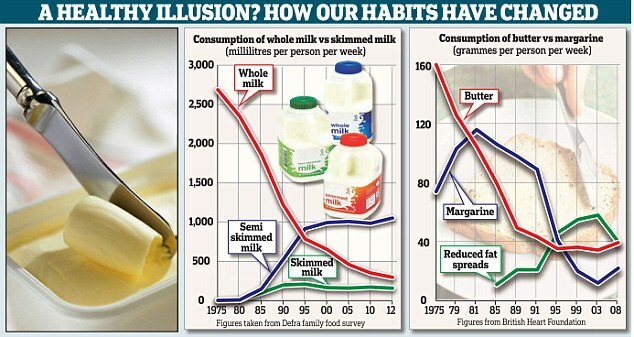 Now my brother is worried that I am eating vast quantities of butter every day – a mention of 800gms at one point! Not true. As with everything else in life it should be taken in moderation. As a banter I take in about 1400 calories a day. I might take 150 of those calories in the form of butter – that’s all – about an ounce an day – it is so luscious and rich – this evening I dropped half an ounce in on top of my scramble before eating – how divine! Other oils that are very good for us are the fish oils – I find salmon delicious – and extra virgin olive oil. Olive oil has other oils added but if the label says extra virgin the producers are obliged by law to add nothing else to the product. Coconut oil is also really good for you, or palm oil – one which I had thought was not good. They are the best ones to cook with as olive oil changes colour as soon as it hits 180 degrees so it is better to use cold. Banting recommends you avoid all seed oils because of the chemicals used in the extraction of said oils. However, if like me you have to live as well as try to maintain a healthy lifestyle, don’t sweat about the occasional meal out that has sunflower oil in the salad dressing – it won’t kill us – at least not quickly! Go on – get out that butter – you know you want to! Previous PostPrevious A night away doesn’t have to scare you anymore. 19 October 2015.